Donald Trump’s victory speech felt more triumphal than usual, which is to be expected given his surprisingly large margin of victory and that this was his third straight win. As everyone knows, Donald’s speeches are off the cuff, so sometimes he doesn’t pick the most accurate words when he’s excited, but still gets the meaning across, unless you are a liberal pundant looking for fodder. 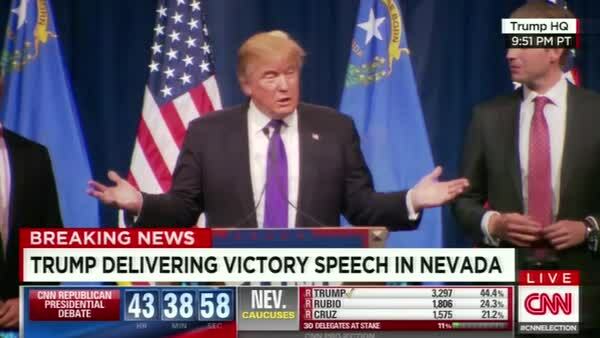 During his remarks to the crowd at Treasure Island Casino, Trump was trying to extol the virtues of all the people who love him, minorities, the well educated, etc, and said he really loves those that don’t have a Ph.D. from Harvard. Well not exactly, the words he chose for the last group was “poorly educated,” which, of course, the media has jumped all over. What everyone mysteriously seems to ignore, is that he immediately included himself in that last group! It’s in the details. “Educated” and “smart” are two different things! That was actually a brilliant statement because by saying he loves the poorly educated, Trump is giving a slap in the face to the elites, whom many voters despise. Trump realizes that he is mobilizing Americans who never before took part in the political process, and want to be recognized. He doesn’t care whether you have a Ph.D. from Harvard or a degree from the school of hard knocks. He just wants your vote.